India vs New Zealand 2nd T20I: Former India captain MS Dhoni showed an example of his street-smartness at Auckland during the 2nd T20I which the Men in Blue won by seven wickets to level the series 1-1 and force a decider. India vs New Zealand 2nd T20I: Former India captain MS Dhoni showed an example of his street-smartness at Auckland during the 2nd T20I which the Men in Blue won by seven wickets to level the series 1-1 and force a decider. Dhoni, as usual, showed off his finishing skills as he took India over the line as remained unbeaten on 20 off 18 balls. The 37-year-old put on his dancing shoes, came down the track, only to realise Sodhi had spotted the move and had thrown it wide of off-stump. Dhoni realised if he missed he would not be able to come back on time. He defended the ball and it was a dot ball. Vintage Dhoni got a rousing reception at Eden Park when he walked out to bat for India during the ongoing 2nd T20I. 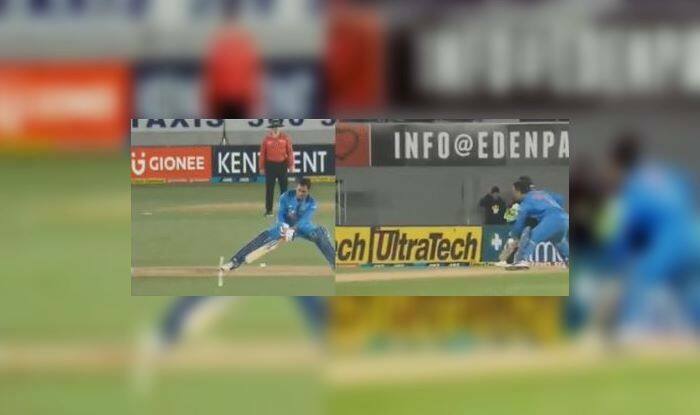 Chasing a moderate 159, Dhoni walked into the middle at the fall of Vijay Shankar. Once the crowd saw Dhoni, they could not keep a lid over their emotions as they all stood up in synchrony to welcome ‘Thala’. It is a must-win game for India to stay afloat in the ongoing three-match series.